Ashlynn Waddell of Swanton, left, after getting the baton from Brooke Dockery in a relay at the Bob Eisenhart Invitational at Tinora Saturday. The Bulldog girls finished runner-up to Archbold and just three points behind the Blue Streaks. 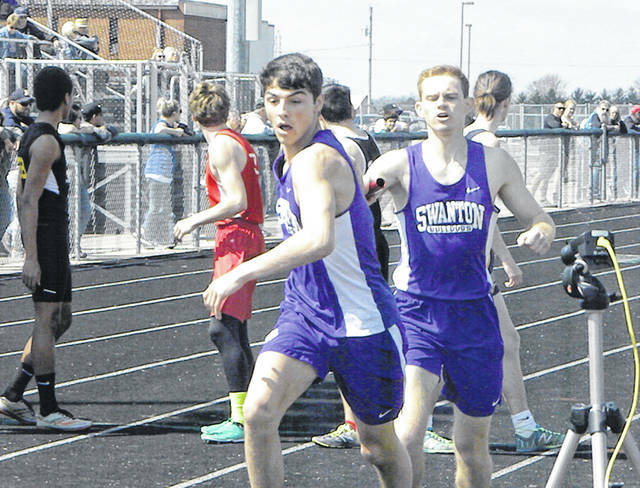 Donovan Avalos of Swanton gets the baton from Brett Bettinger in a relay during the Eisenhart Invitational Saturday. They were members of the winning 3200m relay team. 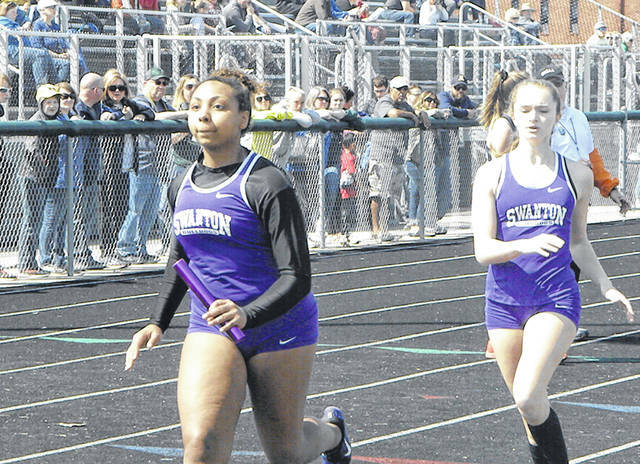 Swanton kicked off the 2019 track and field season last week with the girls team garnering runner-up finishes at an invitational and a tri-meet. The Bulldogs finished three points behind Archbold in the Bob Eisenhart Invitational at Tinora Saturday. Asia Gensch won the 300 hurdles for Evergreen, who was eighth as a team. On the boys side, Swanton won two events. Dylan Gilsdorf won the high jump and was on the victorious 3200m relay team that also included Brett Bettinger, Donovan Avalos and Blake Szalapski. The Viking boys were second to Archbold. Reece Serna led the way with wins in the 100 and 200. He was also on the 400 relay team that won and also included Anthony Sanders, Jack Etue and Hunter Vanwert. The Swanton girls track and field team finished runner-up to host Eastwood last Tuesday in a tri-meet with the Eagles and Genoa. Swanton’s boys finished third with four team points.